O’Brien has taken a case against the Sunday Business Post over a set of articles published in March 2015. 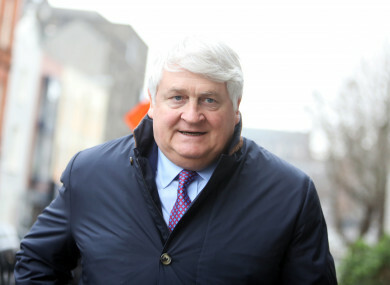 Denis O'Brien arriving at the High Court earlier this week. DENIS O’BRIEN has lost his legal case against the Sunday Business Post newspaper. The businessman has taken a High Court action claiming defamation against the newspaper over articles published across six pages of the newspaper on 15 March 2015. The court heard from three witnesses – O’Brien, journalist and former deputy editor at the SBP Tom Lyons, and its former editor Ian Kehoe – during the trial. Lyons and Kehoe denied defaming O’Brien in those articles over the course of their testimony. The 11 jurors began deliberating yesterday afternoon but could not reach a verdict by the evening. This afternoon, the jury said they didn’t believe it was possible to reach a unanimous verdict after over five hours of deliberations. He said there were very strict conditions attached, with a majority of at least nine jurors needed to reach a decision. When they returned just after 4pm, after deliberating for over seven horus, they returned a majority verdict that O’Brien hadn’t been defamed. Following a submission by Michael McDowell SC for the Sunday Business Post, O’Brien will pay the costs involved in this case. Judge Barton thanked the jury for their service, and exempted them from further service for a period of 10 years. Speaking outside the court, Lyons said it is a “great day for Irish journalism”. “We stood up to him. We fought for a full month. We stuck to our guns, and we told the truth, did the right thing and thankfully the jury came down on our side,” he added. Kehoe said the “easy thing” to do would have been to “cave and not fight these cases”, but they’d “fought it at every step of the way”. The Sunday Business Post welcomed the verdict and said the issues raised in this action are “of critical importance for the media in Ireland”. CEO Siobhán Lennon said the newspaper prides itself on “its independence and objectivity”. “Now more than ever a strong, independent and objective media is essential to a functioning democracy,” she said. Email “Denis O'Brien loses defamation case against Sunday Business Post”. Feedback on “Denis O'Brien loses defamation case against Sunday Business Post”.